UPDATED: A major shake-up of the state’s Community Legal Centres is looming, with the State Government set to endorse the findings of an independent review that recommends streamlining services – and the Attorney-General not ruling out closing some existing facilities. 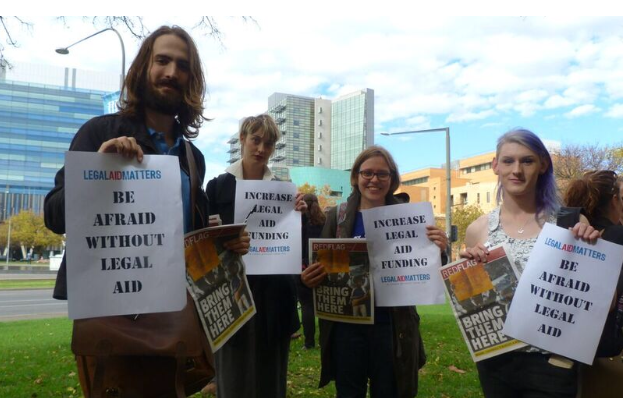 Protestors at last week's rally against the cuts to legal aid services. 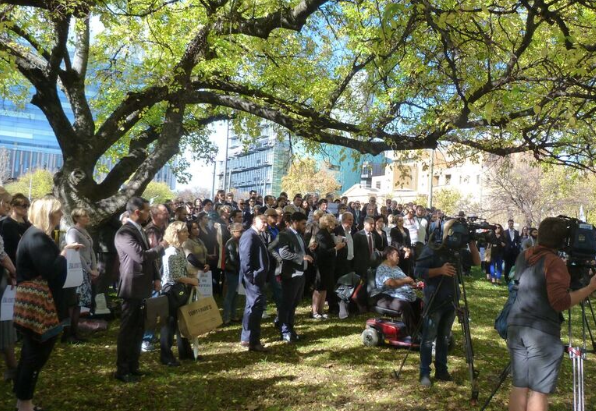 Senior members of the legal community last week rallied against federal cuts which John Rau says will see funding reduced by 40 per cent in three years, leaving “the hard work of cutting expenses to the State Government”. InDaily can reveal Rau intends to implement a new service delivery model for the state’s eight Community Legal Services (CLCs), after a review by Ernst and Young recommended sweeping changes – including potentially integrating functions with the separately-funded Legal Services Commission. Rau wants to free up CLCs to focus on family and domestic violence, and welfare rights. But community legal service stakeholders say the review, while presaging “dramatic” change, is a “missed opportunity” for the state to increase its own funding share, which they argue is less than half that of other mainland states. “The model aligns all activities and decisions related to the management of demand and eligibility for services into a single, integrated point of entry,” the review states. The Ernst and Young report’s “preferred model” is that the Legal Services Commission “provides these integrated support services given [its] expertise and high level of maturity in eligibility assessments and client triage, and the fact that LCS already provides a statewide Legal Helpline and develops resources and information on legal assistance for the broader legal assistance sector”. “This will provide one point of access for prospective clients, thereby facilitating effective demand management, and also free up CLCs to focus on advice and casework rather than duplicating effort in provision of information,” it says. The Government has not committed to shared services between the state’s eight CLCs and the Legal Services Commission, which is funded by the Commonwealth for family law matters and by the state for criminal matters. But Rau told InDaily the plan would facilitate “improvement to their online presence and an attempt to have co-location or outreach arrangements with other community services”. “More work needs to be done on it,” he said when asked if this meant existing offices could be closed. Lawyers and politicians were among those at last week’s rally. The Ernst and Young report advocates that the LSC provides “administrative functions on behalf of the Community Legal Services as part of a ‘back office’ arrangement, where all Community Legal Services operate on the same systems and platforms to enable improved coordination, consistency and performance reporting”. Rau said there had been broad consultation with the sector, saying “we’ve all got to accept we’ve got a problem not of our making”. “Over 90 per cent of service requests are for information and advice,” he said. He said CLCs should be freed up to focus on domestic and family violence matters, serving “vulnerable women and children who need family law assistance if they’re not getting it through legal services”. Rau also said the shake-up would deliver “more focus on outreach services like online support and other co-ordination of that sort, and a statewide mediation service to prevent things getting into a court case if it gets that far down”. There will also be a dedicated Welfare Rights Service. The report talks of an “agile and flexible service delivery”, wherein “outreach would be the primary mode of service delivery, coordinated and undertaken in partnership with other community-based services in locations around the state, particularly in rural and remote areas”. “The model significantly moves away from the provision of a centre-based, fixed geographic approach to service delivery to one that focusses on reaching out to and supporting priority clients as close to their community as possible,” it says. Of the eight CLCs in SA, four have been quarantined from the funding cuts, while another two have had only a “partial loss of funding”. But Rau expects the change to apply to all operators “because we’re obviously going to have the whole sector adopt a different way of doing their service”. “The cuts in federal funding have made this change unavoidable,” he said. SA Council of Community Legal Services co-chair Tim Graham, who is also director of JusticeNet SA, said he welcomed the “efforts by the State Government to look for ways of improving efficiencies and delivering better services for disadvantaged clients”. “We obviously need time to work through the recommendations of the proposed changes to the way CLCs work, because they’re quite dramatic changes being proposed,” he told InDaily. He said the State Government had been “working out how its going to spend a reduced amount” of Commonwealth funding “and do the same with less”. “But the missed opportunity is that the State Government has not looked at its own contribution,” he said. Graham said the SA administration was “significantly out of step with other mainland states, in that its contribution to the sector is less than half what other mainland states contribute”. Legal Services Commission SA director Gabrielle Canny welcomed Rau’s “commitment to the legal assistance sector and the State Government’s efforts to maximise service delivery”. “We will work with the Attorney and community legal centres on initiatives to streamline services and provide increased efficiencies wherever possible,” she told InDaily in a statement. “Community legal centres are a vital part of the legal assistance sector and they provide many frontline services to disadvantaged South Australians.